Marketing a software-as-a-service application is more like marketing packaged software or consumer electronics than enterprise software. The reason is simple: enterprise software is delivered in an unfinished state. The so-called product is specified, configured, customized, integrated, tested and maintained from a base foundation to deliver a unique solution�a product of one. Taking a product from an unfinished to a finished state requires lots of direct labor. In a SaaS business, direct labor is your enemy. Automation is your friend. 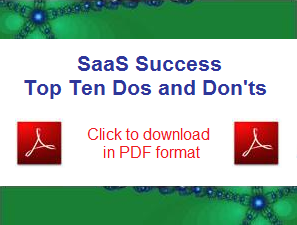 It is easy to cover up shortcomings in your SaaS business with people. No online leads; go to a trade show. No online trial; give us a call. No online purchase; talk to a salesperson. Product too complex; speak to a services rep. Found a bug; contact technical support. Want to upgrade; speak to your account manager. When you neglect to automate core business processes and then cover it up with people, you ensure long-term unprofitability and engender a culture that undermines long term success. Imagine that you are launching your product from a desert island with nothing but an Internet connection. Solve problems through automation, and then add people to push sales and service performance over the top, not to provide the basic function.